4th Update 1:15 p.m. EDT U.S.A. “Daily-Earnings,” yet another Ponzi-board scheme pushed by Achieve Community huckster Rodney Blackburn, appears to have met its demise. The “https” dotcom for Daily-Earnings is publishing a “Your web space is ready to go!” message, suggesting front-page content has been moved from the site. Not all pages of the site, however, are offline. An FAQ page, for instance, is publishing ads for “programs” called SecretSocietySystem and “ILuvBanners.” There’s also an ad at Daily-Earnings for Intellashares, a “program” that collapsed earlier this year but now is trying a relaunch. Blackburn pushed Achieve Community, which the SEC described in court filings on Feb. 12 as a combined Ponzi- and pyramid scheme. He also has been associated with “Trinity Lines,” a collapsed “program” trading on the name of God, and Automatic Mobile Cash, which appears to have collapsed in March. The huckster also created a combined ad for Achieve Community, TrinityLines and UnisonWealth. The SEC declined to comment on the promo. At one point, the MooreFund and RockfellerBiz “programs” came into the fold, with Blackburn blessing both of them. 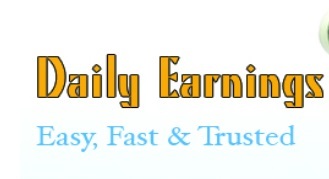 His promo for “Daily-Earnings” appears to have been published on Feb. 28, a little more than two weeks after the SEC’s Achieve Community action. At the time, the actual Daily Earnings site was displaying ads for other scams while hawking “AdPacks.” The “program” possibly operated from Istanbul, Turkey.